Odds are, unless you live in the Southwest, this winter will go down as one of the coldest/snowiest in recent history. Here in Madison, Wis., where I reside, I heard a local meteorologists say this is the eighth coldest/snowiest winter on record. On a bright note the current seven day forecast does have a few days hovering at or near 40 degrees! Woot! Unfortunately warm weather causes trouble in cold weather climates. Earlier this week the Wisconsin Department of Transportation (WisDOT) told motorists to be on the lookout for potholes. Potholes form when moisture enters cracks in pavement, freezes and then expands. I rolled through the pothole below while dropping my daughter off at dance class earlier this week. Luckily, my car wasn’t damaged but, this sucker felt like it was as deep as the Grand Canyon. Warmer temperatures and traffic can cause pieces of pavement to break free that were loosened by expanding frozen water. Wisconsin has already seen a 60-percent increase in the number of winter storm events. As the snow and ice melt it creates the perfect conditions for potholes. As I mentioned earlier the winter weather woes are not limited to Wisconsin and neither are the pothole problems. Delaware, which experienced its third-worst winter according to this article, only had $6.3 million budgeted for road patching this fiscal year. They’re already down to about $2.2 million. With lots of thawing and freezing left that’s just not going to cut it. Delaware’s Department of Transportation says crews have already patched about 4,400 potholes. According to this article which appeared on mlive.com, Ann Arbor, Michigan is also feeling the pain. City Administrator Steve Powers says the city laid down 251 tons or about 502,000 pounds of asphalt in February alone. In February of 2013 they only laid down 100 tons. The city has also received more than six times the number of complaints about potholes than they did last February. Maintain your manufacturer’s recommended tire air pressure. Properly inflated tires provide the best buffer between broken, dipping pavement and your ride’s wheel rims. Over or under-inflated tires are not good. Tires that are too-firm tires are just as bad as tires that are too-soft when it comes to preventing pothole damage. Make sure you leave enough space between you and the vehicle you’re following. This way, you’re more likely to spot potholes before they wreak havoc on your ride. During damp, inclement weather, it’s tough to judge the depth and size of a pothole – or see it at all. When driving during crummy weather, proceed at a reduced speed. That extra caution may help you identify driving hazards, such as potholes, before they can cause damage your vehicle. Want to avoid pothole problems entirely? Who doesn’t? The easy answer is to bypass them, period. Limiting your time on the road can be tough. After all you have to drive to pick up the kids, get groceries and of course make it too and from work. You can eliminate some of that driving and reduce risk with TDS’ managedIP Hosted business VoIP phone system. managedIP offers features like simultaneous ring. Simultaneous ring will alert multiple phones preselected by you, like a cell phone, when calls come in to their desk phone. So you’ll be able to answer work calls on your cell phone. Couple this with remote access for your workstation and you can work from home, or wherever, without missing a beat. 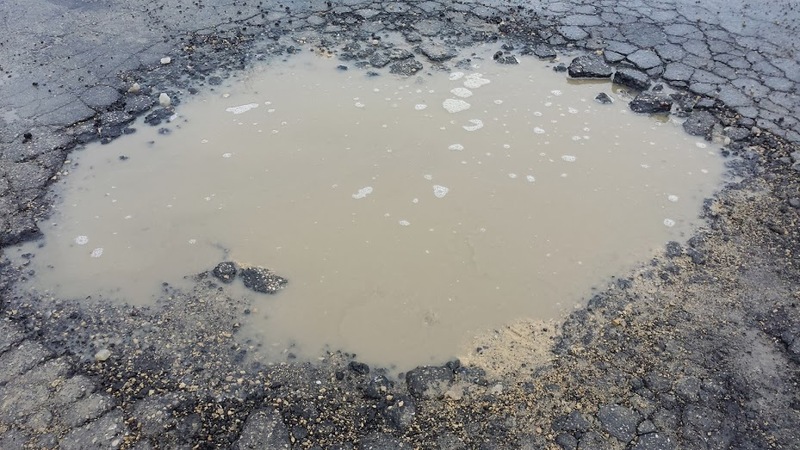 The only thing you may miss is costing yourself several hundred dollars in costly car repairs from this year’s abundance of potholes. But that’s probably a good thing.